Whether you’re a fan of the Three Musketeers, Zorro or Captain Jack Sparrow, watching a swashbuckling sword fight is a great way to get your spirits up and your heart pounding. It’s fun to imagine yourself in the midst of the fighting, moving with lightening reflexes and wielding a flashing blade. It’s been said that the tip of a fencer’s sword can move almost as fast as a marksman’s bullet. While the sport of fencing doesn’t feature leaping from balconies or swinging from ship to ship on thick ropes, it’s a fast-moving sport, with plenty of excitement and fierce competition. Fencing has been featured in every Olympic Games since 1896, and is a year-round sport. Even so, few Americans have ever seen a real fencing tournament, and fencing is rarely televised in the United States. If you’d like to see real fencers in action, or you’re tempted to give fencing a try, you’re in luck. Fencing is a club and team sport, and you’re likely to find fencing clubs in big cities, small towns, college campuses, and many high schools and prep schools across the country. All you need to do is call them up, attend their beginner classes, and you’re on your way. Fencing is a combat sport and your eventual goal will be to compete in tournaments. As you progress through your beginner and intermediate classes, you will test your skills against your classmates and other members of your club or team. Fencers face off on a 6-foot by 44-foot strip called the piste, using a wide variety of techniques specific to one of three competition weapons: foil,épée, or saber. You’ll compete locally, statewide, regionally, and if your results qualify you for the big time, you may go all the way to the Junior Olympics (if you’re 19 or under) or the national circuit. The best of the best will compete for spots on the National and Olympic teams, and compete worldwide. When you start your lessons, most clubs will supply you with everything you need. You can show up wearing sweatpants, a t-shirt, and sneakers, and you can either rent or borrow a beginner’s fencing jacket, plastron (under arm protector), glove, mask, and practice foil. After a while, you’ll probably buy your own glove, and then add pieces from there. There are three weapons in fencing: foil, épée, and saber. Each weapon has a different shape and feel, requires different fencing techniques, and adheres to different rules. Your first weapon will be a practice foil, with a basic French grip handle and a plastic tip on the point of the blade. Later, when you compete at tournaments, you will need electric equipment and will probably switch over to a pistol grip, for more control. When you begin fencing lessons, you will start with a foil. Foils are close to three feet long and are flexible, allowing fencers to sometimes flick the blade and make surprise attacks from odd angles and directions. 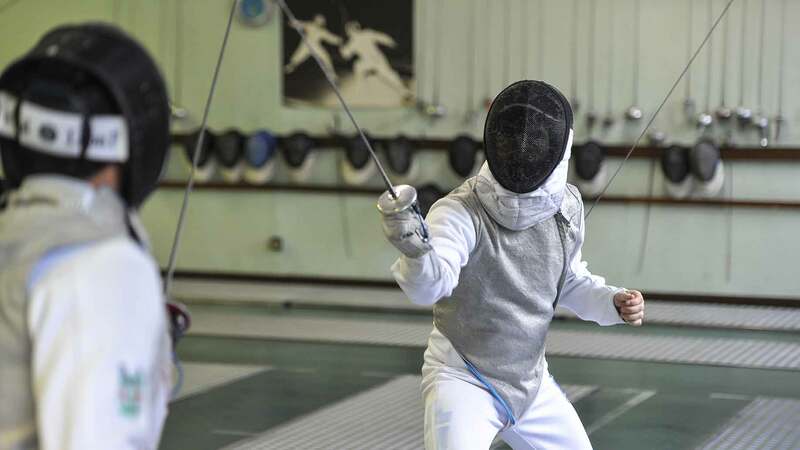 A “touch” occurs when a fencer gains right-of-way and manages to hit the opponent’s target area with the tip of the foil, exerting a certain amount of pressure. The torso, front and back, is the target area for foil; off-target areas are arms, legs (including buttocks), and head. The rules of right-of-way are complicated, involving, among other things, defensive parries and ripostes, as well as the offensive attack and remise. During practice competitions, a referee (called a Director) and possibly side or corner judges determine who gets each point. Once you start fencing competitively, you’ll switch to electric scoring. An electric foil has a blunt, spring-loaded tip and is wired so that when the tip hits your opponent’s electrically-wired vest (lamé – pronounced lah-MAY) with enough force, the scoring machine displays a hit. A referee is still present during electronic bouts, to start and stop the action and make final judgments and decisions. Épée (pronounced EH-pay) is the French word for sword. The epee is heavier than a foil and has a stiffer, thicker blade. Touches are scored only with the point of the blade, but the target area is the entire body, from head to toe. Epee requires a harder touch to score a point, and right-of-way rules do not apply. Originally used as a cavalry weapon, you can score a saber touch with either the point or the edge of the blade. Target area includes the entire body from the waist up, excluding hands and the back of the head. As in foil fencing, the rules of right-of-way apply (with subtle differences), and saber fencers must therefore move very quickly yet precisely. A saber fencer wears a long-sleeved lamé that covers the arms and torso from the waist up. You’ll start with a beginner jacket, but if you stick with the sport, you’ll want a uniform that is lightweight, wicks moisture away from your skin, and stretches to allow for greater comfort and mobility. The high-end jackets are lined with the very latest in moisture–wicking fabrics, and feature two-way stretch and a great fit. For your beginner lessons, sweatpants will do just fine, but once you start competing outside your club, you’ll need fencing knickers. Again, the pricier pants feature high-tech fabrics for comfort, moisture wicking, and fit. A fabric plastron is an underarm chest protector that you wear beneath your jacket to protect against bruising. Women’s chest protectors are molded from hard plastic and protect the entire chest. Masks range from the very affordable beginner’s mask to three-weapon mesh masks featuring stronger mesh and greater comfort. At the very top of the line are transparent masks. In an effort to boost popularity and public interest in the sport, transparent masks were introduced to international competition so viewers could see the fencers’ faces. However, following reports of injury during particularly violent epee bouts, the International Fencing Federation (FIE) has temporarily suspended use of transparent masks in epee. As of January 2008, though, transparent masks are compulsory for international foil competitions. Fencing shoes are lighter weight than basic sneakers, and designed very differently than a cross-trainer or running shoe. The high-end shoes feature advanced design – cooler, stronger, and lightweight. Beginner’s standard weight jacket, pants, and plastron. Higher prices represent ultra lightweight and flexible lamés made of single filament polymer base impregnated with silver. Saber lamés are also higher priced due to the added fabric required for long sleeves. The body cord plugs into the base of your weapon, runs up inside your sleeve, down your back (inside your jacket), and out the bottom of the jacket to connect to a retractable reel at the far end of the strip. At the very most elite tournaments, scoring is on a wireless system; body cords are used in local, state, regional, and national meets. You will need a special fencer’s duffel bag to carry all your gear. If you plan to travel to tournaments, buy a bag with wheels, since all that gear gets heavy. Electric fencing systems are far from perfect. Weapons fail, body cords fail, touches are either falsely recorded or not recorded at all. When this happens, fencers ask for rulings by the Director, and they may test their weapons many times throughout a match, to ensure that when they strike their opponent correctly, they receive a point for the touch. It is essential that each fencer have back-up weapons and body cords in case of problems. At large tournaments, armourers—experts at fixing fencing equipment—are available for emergency repairs. Fencing clubs welcome new members of just about any age. Children as young as six can take non-competitive lessons, and fencing is billed as a “lifetime sport” that you can enjoy for decades to come. Each club has their own schedule of classes, but generally, you start out with a series of beginner group classes that will teach you the basics: body position, rules, weapons, and early offensive and defensive moves. As you progress through Beginner, Advanced Beginner, and Intermediate levels, your coach will help you acquire your own equipment as you hone your skills in preparation for your first real tournament. Private lessons are always available. While the point of fencing is to compete, there are plenty of tournaments that are based more on the idea of having fun than getting your name moved up in the rankings. Team or club competitions are sometimes followed by a cookout or potluck. USA Veterans Fencing is specifically for fencers over age 40 who still want to participate in the joy of fencing and fraternizing with fencers. Non-competitive classes are available for children as young as six. Entire families sometimes get into the act. If this sounds intriguing to you, give it a try. The swashbuckling world awaits.